After the corruption scandal of the conservative government, the Czech government had to step down. Since June, the Czech government is led temporary by the technocrat Jiri Rusnok. Tomorrow, the Czechs will elect a new Parliament. According to latest survey, the social democrats are the clear winners. With 26% support, the oppositional party would rank first. The social democrats are followed by the Communists and the new party ANO. ANO was founded by the Czech billionaire Andrej Babis. The underlying reason behind the strong support for the social democrats is not only the corruption scandal of the bourgeois ODS, but also the austerity policy of the last years. According to the social democrats the fiscal policy should be eased. 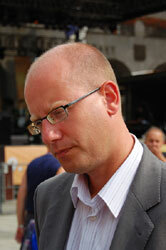 Bohuslav Sobotka, party leader of the social democrats intends to increase taxes on top earners. Moreover, the Czech banking sector may face bank taxes. After Austria, Hungary and Slovakia, the Czech Republic would be the fourth EU member country introducing bank taxes. However, the Czech people are used to difficult political frame conditions. In the last decade, the Czech Republic had eight prime ministers, which is more than any other EU country had in the same period. In total, up to seven parties may enter the Czech parliament. Finding a majority will be difficult for the winners of the election. Moreover, the social democrats still hesitate to form a coalition with the communists. As a result, the social democrats consider establishing a minority cabinet. But also in this case, the social democrats would need support from the communists.